This game goes well with persuasive or non-fiction writing pieces. We also play it at animal locations such as the Carolina Tiger Rescue shown in the above picture. The game requires two magnetic spinners* so it makes buying your spinners worth it! 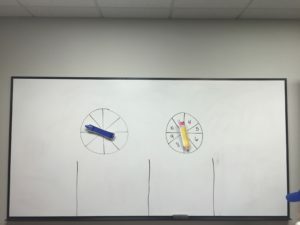 I draw two circles on the white board, chalk board (or smart board). 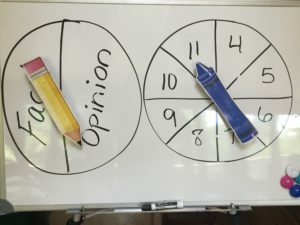 I divide the left circle into two sections and write the words Fact and Opinion. 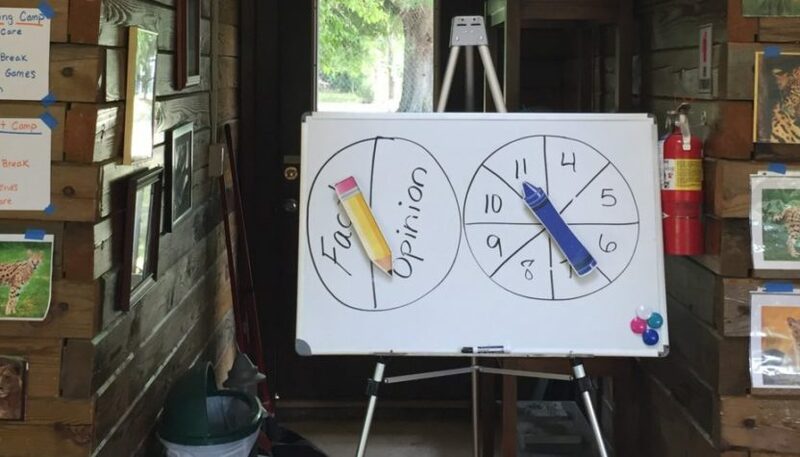 The right circle is divided into 8 sections and has the numbers 4-11. 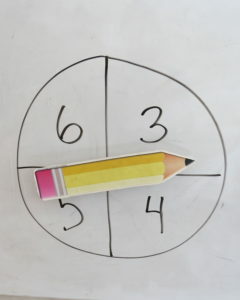 (If you’re only working with younger children, I suggest dividing the right circle into 4 sections and writing the numbers 3-6). The numbers represent the number of words the students must use in their fact or opinion sentence. For smaller groups (up to 8) I divide the board into 4 sections. A pair is assigned to each section. 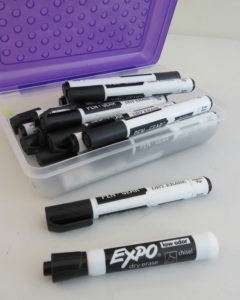 For larger groups, or if I don’t have a large whiteboard, I divide the group into pairs. 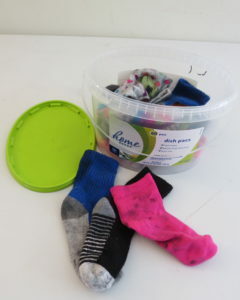 I give each pair a small white board, dry erase marker and a sock to serve as an eraser. You can purchase a class pack on Amazon*. One pair of campers spin. One partner in each pair takes a turn writing a fact or opinion sentence that uses the number of words that is spun. The fact or opinion sentence can be normal or super silly! 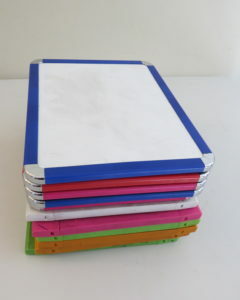 In order to earn a point, the sentence has to have a capital letter, spacing, correct spelling and a period at the end. Once they’ve completed their sentence, they don’t say anything. They just hold up their white board. I look at it. If there is one mistake, I hold up 1 finger. If there are 2 mistakes, 2 fingers, 3 mistakes, 3 fingers, 4 mistakes, 4 fingers. If there are no mistakes, I give them a thumbs up and they tally a point. If they have a mistake they continue to correct the sentence until I give them a thumbs up. 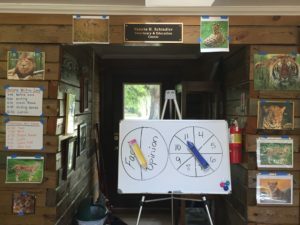 Campers who get a thumbs up right away can keep writing new sentences, earning more points, until each camper has finished their one sentence. Once each pair has correctly written the sentence, then we move onto the next turn. We continue play until each pair has had a chance to spin or the time allotted runs out! To take the game a step further, you can add a third circle with words in it. 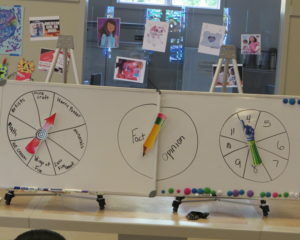 The writers have to write a fact or an opinion, using the spun word and spun number of words. Here are the instructions for you to print out and use. We played this game after writing the Lions-A Persuasive Speech and the Apples Opinion With a Twist prompts.